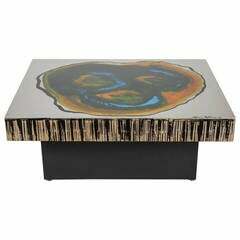 One of a kind Marc D'Haenens coffee table, circa 1980, Belgium. Coated and painted metal top, center pink quartz enshrined in fine gold setting. 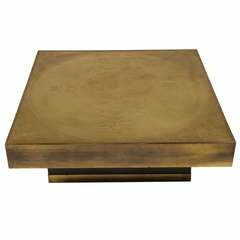 Painted wood base, brass. Dimensions: 120 cm diameter, 34 cm height. Signed. Good original condition. 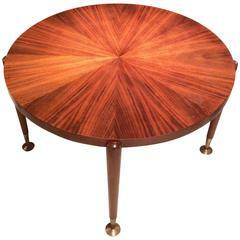 French Art Deco coffee sunburst wood round table, circa 1940. Brass details on the feet. 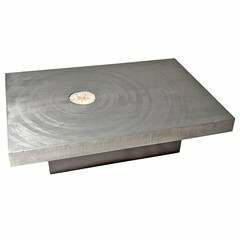 Measures: H 56 cm, diameter 90 cm. Good condition. We ship worldwide. 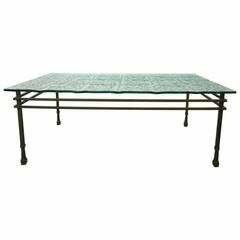 1970s Belgian rectangular aluminum acid etched low coffee table with an inset agate (lighted) top and resting on an ebonized rectangular solid base (by Marc D'Haenens). Mid-Century Modern artistic coffee with table by Marc d'Haenens With a center quartz inlay and an acid etched top resting on two bases Signed by Marc D'Haenens Belgium, 1970s. 1970s Coffee Table designed by Marc d'Haenens. Signed.